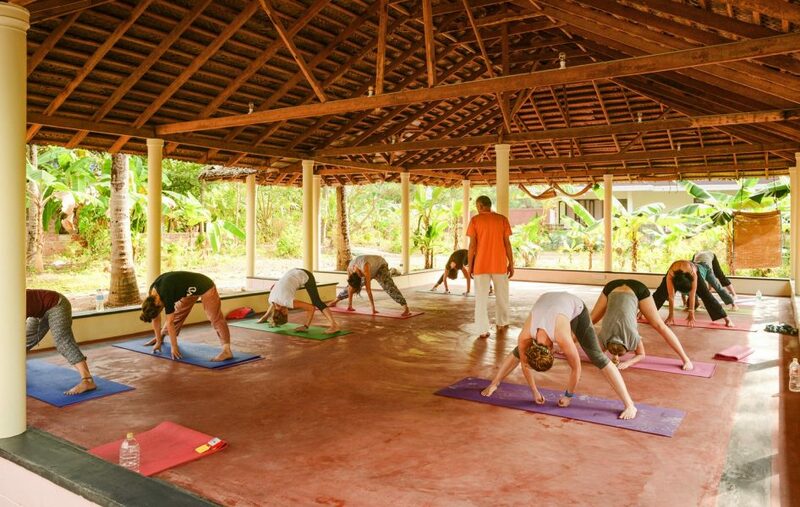 Sharanagati Yogahaus, your authentic Yoga Retreat in Varkala, is a perfect place to spend your time in Kerala. Located in a very quiet part of Varkala Beach and surrounded by natural gardens, it is very peaceful and calm. 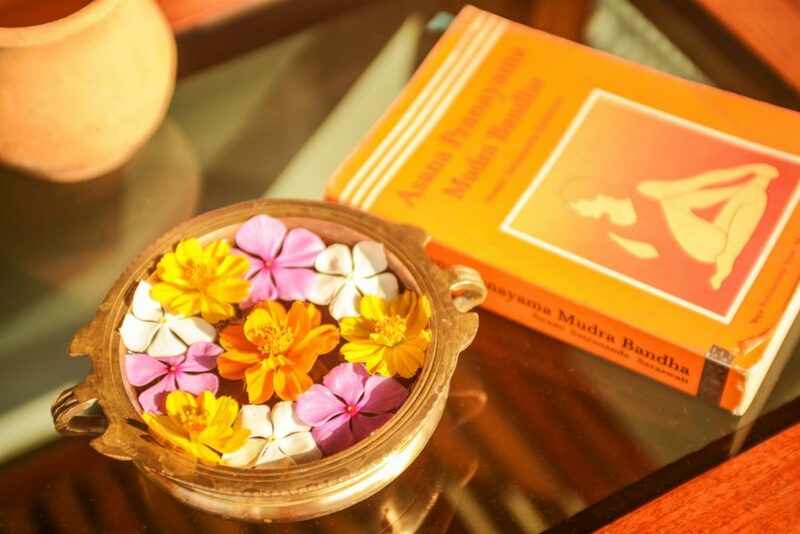 Just what you are looking for in a relaxing Yoga retreat. Letting go of all responsibilities created for this lifetime, and peacefully surrender to a rejuvenating and healing break. 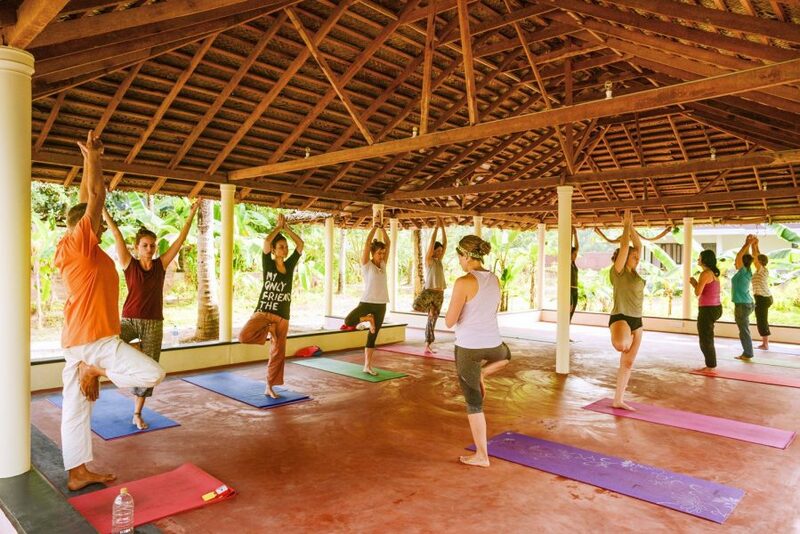 We limit the Yoga retreat to a maximum of 15 people, and often there are less. There are no drop in classes, as our retreat is for residential students only. We do not use cell phones, or computers on the premises, to keep ourselves away from distractions, we often are not aware of anymore in our daily lives. You will feel the difference in Energy the minute you walk in. 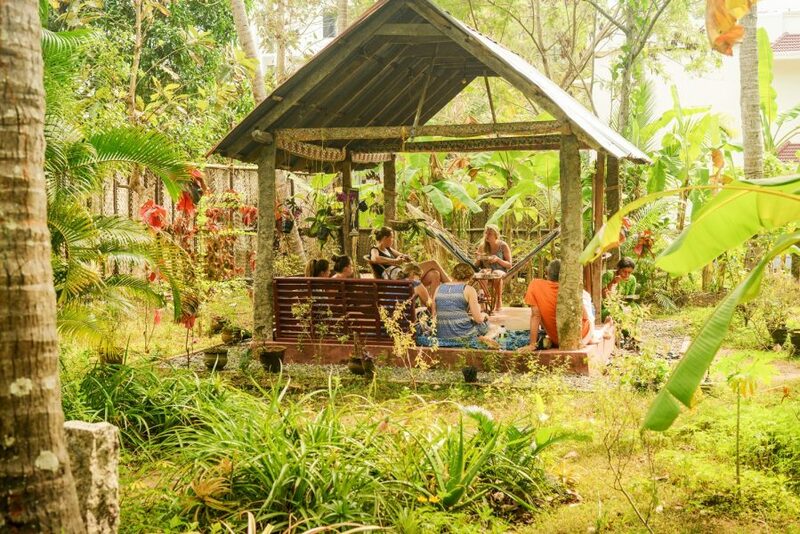 We are looking forward to YOU having a wonderful, relaxing and well deserved Yoga Vacation with us at Sharanagati Yogahaus.
" Inhale and Exhale deeply, calmly observe your breath, and please mind the gap"! 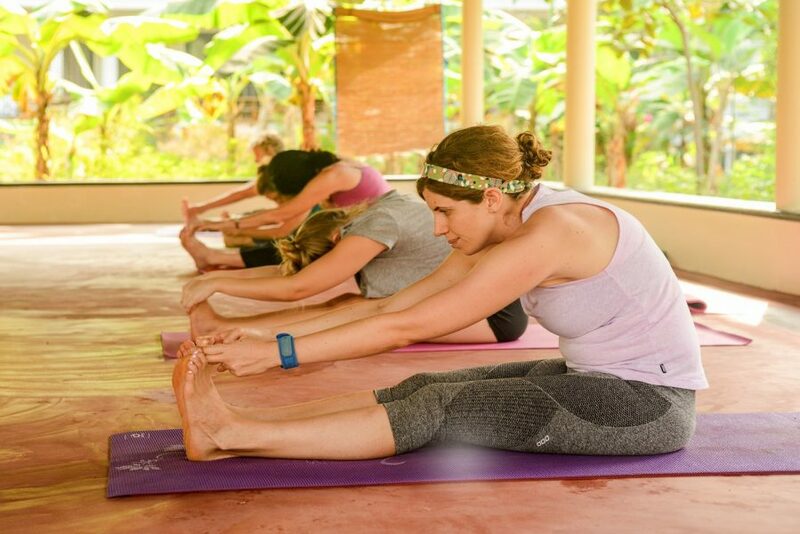 Over the last 7 years we created a wonderful, calm and very natural environment to practice yoga asanas, pranayama, and meditation here in Kerala. And foremost to just BE at Sharanagati Yogahaus. Our Asana practice is based on Sivananda Yoga, presented in a very relaxing and meditative way. Hari spent 3 years with the Sivananda organisation, in California, Canada and India. Asanas provide a gentle stretching that acts to lubricate the joints, muscles and ligaments, tendons, and other parts of the body. The inner organs will be well balanced. Asanas help to tone the nervous system, improve circulation, release tension increase flexibility, give us a overall well being and most important prepare us for pranayama and meditation. Practising asanas regularly will help us to look at our habits and behavior patterns in a more healthy manner. For the yogi of the 21th century a thorough understanding of complete relaxation is far more superior than an overly flexible body. For us it is important that YOU after spending time with us, take home a practice you can integrate into your daily life. If you like, we provide you with a recording of our yoga class, you can listen to and practice at your home. Hari's teaching clearly reflect his background in Buddhist meditation, as he emphasizes strongly on the breathing, and is gives a lot of space for the individual during class. The awareness and calmness he brings to his yoga class is well appreciated by his students. Prana means breath, respiration, life, vitality. Ayama means stretch, expansion, length, regulation, restraint, control. Pranayama is a technique to make the respiratory organs move and expand intentionally, and intensively. It consists of inhalation (puraka), exhalation (rechaka) and retention of breath (kumbaka). 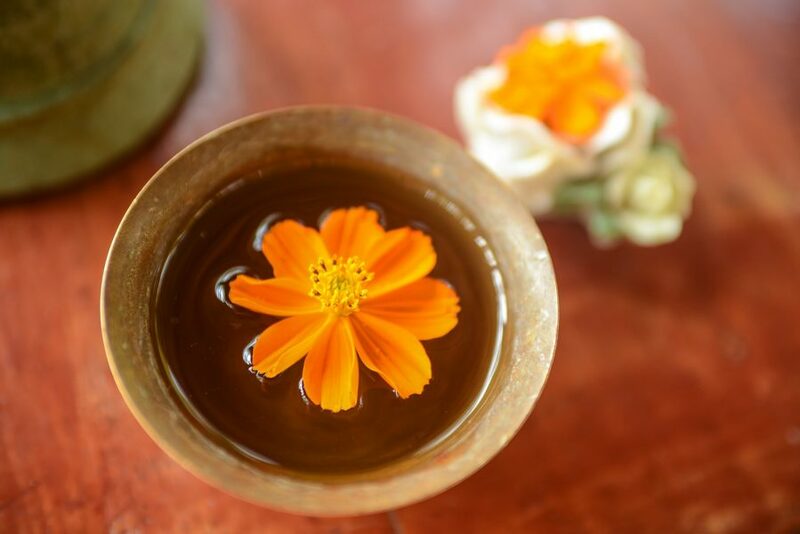 Puraka stimulates the system, rechaka removes stale air and toxins, kumbaka distributes the energy throughout the body. There is external and internal retention. For the beginner, pranayama should be guided by a qualified teacher. We feel comfortable to guide you, and prepare you for your practice in your day to day life. The regulated breathing purifies mind and body, and helps the mind to concentrate, and prepare for meditation. Our daily morning pranayama practice is a combination of techniques that are simple and easy to understand, and we make sure to teach it to you in a step by step approach. 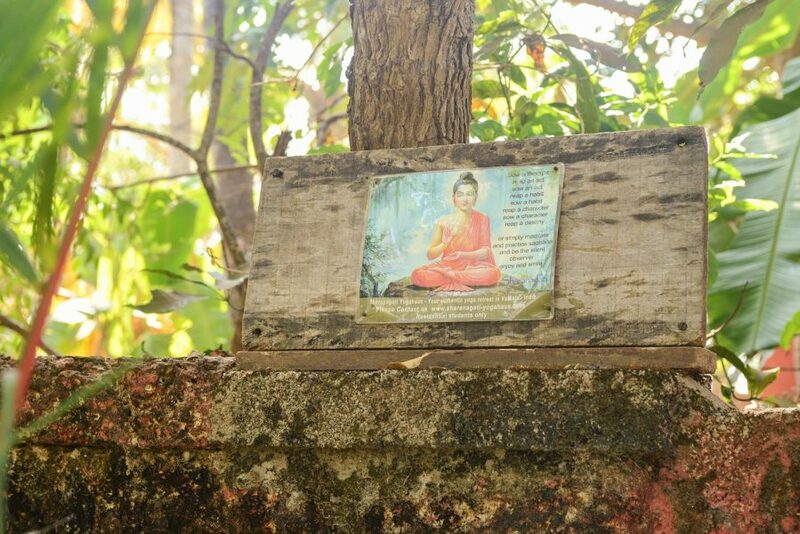 Vipassana, which means 'to see things as they really are', is one of India's most ancient technique of meditation. It was taught in India more than 2500 years ago, by the Buddha, Siddhartha Gautama. The word Buddha means 'awakened one'. Vipassana meditation is a logical process of mental purification through self-observation. At times we all experience agitation, frustration and disharmony. Instead of taking 'our moods' out to the world, we simply listen to it as the silent observer. Step by step learning about our true nature, not getting upset, but deeply understanding it and bringing the right attitude to it. Understanding the role of our ego will lead us to see things as they really are, without taking them for 'to personal'. The highest goal of Vipassana, is to be fully liberated from all mental defilement. Hari learned Vipassana meditation thoroughly at the Abhayagiri Monastery, where he spend one year in the forest as an Anagarika. His approach is very clear and to be easily understood by his students. About this mind-in truth there is nothing really wrong with it. It is intrinsically pure. Within itself it;s already peaceful. If the mind is not peaceful these days, it;s because it follows moods. The real mind doesn't have anything to it; it is simply an aspect of nature. It becomes peaceful or agitated because moods deceive it. The untrained mind is stupid. Sense impressions come and trick it into happiness, suffering, gladness, and sorrow, but the mind's true nature is none of those things. That gladness or sadness is not the mind, but only a mood coming to deceive us. The untrained mind gets lost and follows these things; it forgets itself. Then we think that it is we who are upset or at ease or whatever. But really this mind of ours is already unmoving and peaceful - really peaceful! Just like a leaf which remains still so long as the wind doesn't blow. If a wind comes up, the leaf flutters. The fluttering is due to the wind-the fluttering of the mind is due to those sense impressions; the mind follows them. If it doesn't follow them, it doesn't flutter. If we know fully the true nature of sense impressions, we will be unmoved. Our practice is simply to see the '"Original Mind"". We must train the mind to know those sense impressions and not get lost in them, to make it peaceful. Just this is the aim of all this practice we put ourselves through. Text from ""Food from the Heart"", a book of collected teachings of Ajahn Cha, done by the Abhayagiri monastery, Grass Valley, California, where Hari spent one year as an Anagarika. The teachings of Ajahn Cha are the purest and closest to the heart of all he underwent in his spiritual Quest. With great respect to you Venerable Ajahn Cha, Thank you.